LONDON (VIP-NEWS) — Figures suggesting there's been a big drop in the number of gigs at major venues across the UK. The worst hit areas include Cardiff, Edinburgh, Manchester and Birmingham. The number of performances in these places has almost halved compared to last year, according to ticket search engine Tixdaq. Rob Hallett, head of international touring at AEG Live, says bands are now focusing on other markets including Asia and Eastern Europe. "It's facilities – it's as simple as that. In Murrayfield, it's 55,000 people in a city the size of Edinburgh," he said. "How many groups can sell 55,000? As a band or as a punter you don't want to be there with 20,000. It's miserable. "And it's the same problem with Cardiff. 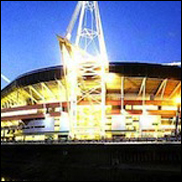 The Millennium Stadium is a great stadium, but it's too big a stadium in too small a town," he said. Hallett, who promotes Justin Bieber and Jennifer Lopez, also explained that there were new markets with bigger demands opening up around the world. "South East Asia has come up big since its economy recovered. Some of the strongest markets in the world are Jakarta, Kuala Lumpur, Manila, Seoul. We're playing all those markets regularly.